Beginner beekeepers may find themselves confused at first by some of the equipment used to keep bees. One seemingly odd but absolutely essential tool for anyone working with bees is a BEE SMOKER. While it sounds a little strange, it is actually a relatively simple device and a vital part of any beekeeper’s supplies. So exactly what is a bee smoker? Simply put, a bee smoker is a device used to produce and disperse cool smoke around a honeybee hive. It is made of a metal, lidded canister with bellows attached. The canister is either double-walled or, more commonly, surrounded by a wire mesh to keep the beekeeper from getting burned. There is a lidded spout where the smoke exits when the beekeeper smokes the hive. 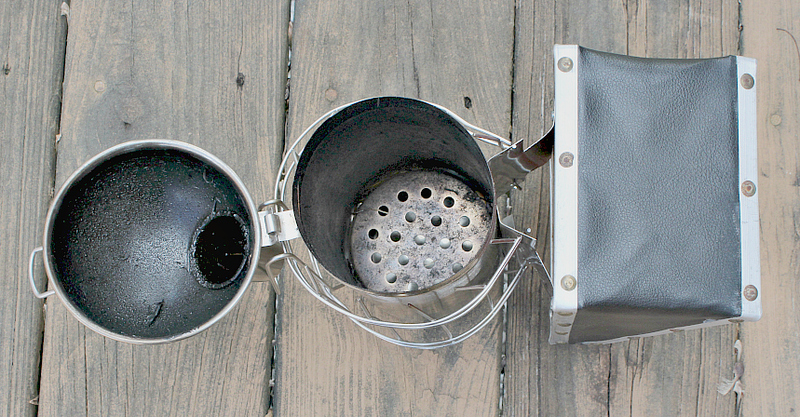 To use a bee smoker, the beekeeper first puts a clean-burning, natural material into the canister. Using natural, non-toxic materials inside the smoker is a must as toxic smoke can sicken or kill the bees. Pine needles, rotted wood, and egg carton cardboard all make good smoker materials. Many beekeeping supply sources also sell clean-burning smoker fuel made from natural materials like paper pulp or cotton. Once the desired organic material is placed in the canister of the bee smoker, the beekeeper ignites the material and closes the lid. The closed-canister design of the bee smoker means there won’t be enough oxygen inside for the organic material to burn outright. Instead, it will smolder slowly, creating the desired cool smoke. Pumping the bellows will push fresh air through the canister. This action works to keep the organic material inside smoldering while also expelling smoke out of the canister through the spout. The beekeeper pumps the bellows over the hive to disperse the smoke among the bees. When the bees smell smoke, they think there is a fire. They become concerned that they will have to abandon the hive due to the fire, so they turn their attention to ingesting honey for the energy to flee. This means they pay less attention to defending their hive against the “intruding” beekeeper. There is also speculation that when the bees’ stomachs become rounded from eating the honey, they are no longer able to sting effectively, but this claim has not been scientifically proven. For the beekeeper, it is helpful enough to have the bees distracted from his activities while they prepare for an anticipated evacuation of their hive. For the bees, being occupied with eating keeps them out of harms way when the hive frames are moved. The smoke dispersed across the hive by the beekeeper masks the scent of the guard bees’ “alarm pheromones.” Pheromones are, basically, a chemical scent that, when secreted, causes a certain social response within the hive. Without the smell of the smoke to mask the “alarm pheromone” given off by the guard bees, the entire hive would turn its attention to defending the hive from the intruding beekeeper. We can easily imagine why having hundreds of bees attacking the beekeeper would not be a good thing! 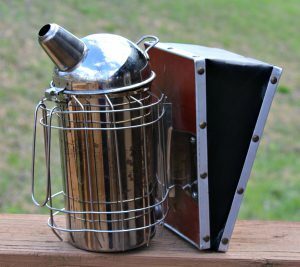 Thoroughly answering the question “What is a Bee Smoker?” gives us insight into not only the beekeeping tool itself but also safe beekeeping practices. The best beekeeping methods support both the bees and their keepers. A little smoke goes a long way towards making hive inspections safer for both. The bee smoker is a simple and effective tool that ensures there’s always a little smoke exactly when it’s needed, even when there’s not a fire. I enjoyed this article about smoking bees. I found it very educational and interesting. Thank you. Thank you, Ruth. I appreciate your visit!